It's considerably well known that Mani Neumeier is a musical "legend" of his own. Jazz connoisseurs know about his musical beginnings as a member of the Irene Schweizer Trio, and that he was regarded as one of Europe's biggest rhythmic talents (Joachim E. Behrend) already in the Sixties. Guru Guru made him well known - if not even famous - throughout the world; his side projects Terra Amphipia and Tiere der Nacht are rather for specialists, and with Lover 303 he once again reached the young ones and is appraised enthusiastically. He himself thinks that it's a pity that his solo concerts often don't receive the attention of his other projects. He almost likes them most as they open the chance of a special relationship with the audience. 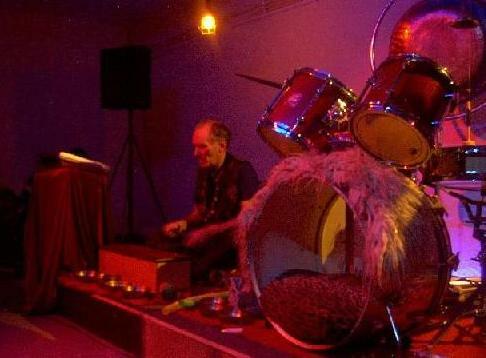 Mani Neumeier on the eve of my birthday, in my town, and Mani himself had given notice of that concert on my telephone answering system… every reason in the world to go to this concert. The venue is an art gallery where also writers' readings and concerts take place every now and then. The place gives room for about 80 to 90 people and it was well occupied that evening. 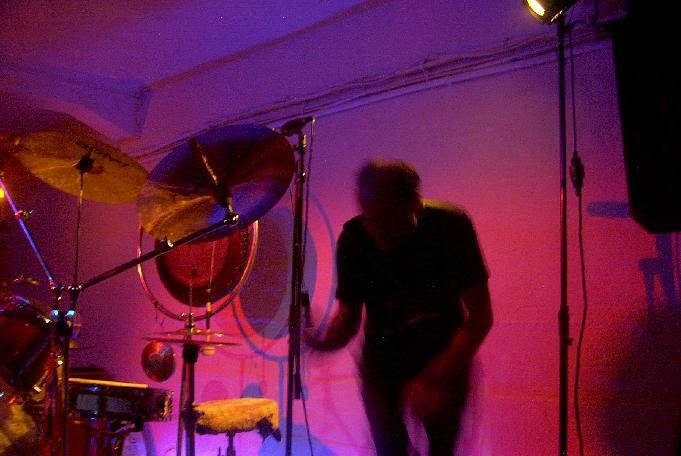 Mani approaches the stage through the audience, a small Casio keyboard bound in front of his forehead, that produces a simple rhythm that, together with jungle noises provides the background for the first piece: a collage of noises produced with the help of toys and a multitude of objects, usually not assumed to be parts of a drum set. A small fire in a tin bucket illuminates the scenery and spreads a mild smell of smoke, that additionally supports the jungle atmosphere. 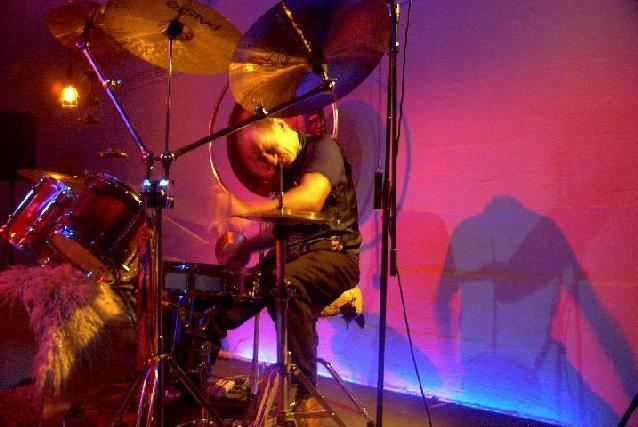 Altogether the concert is a blend of solo works for drums and a kaleidoscope of noises that can be produced by almost any source that are tied together to form rhythmic patterns.